It’s time to share some of our food and service choices, this time for North Florida. Let’s begin with Food recommendations in the Pensacola area. If you’ve read our blog for a while, you know that Jim and I absolutely love visiting and supporting local businesses as we travel, so we look for local first. He and I didn’t realize Another Broken Egg was a chain until after our visit. Even though a chain, the location in Pensacola makes our list for good food. I give you one word of warning though. One breakfast order is enough for two people. Jim and I didn’t know this and forgot to ask about portion sizes, so he and I each left half of our food there since we’d be sightseeing the rest of the day. Order well and order wisely unless you want leftovers. Atlas Oyster House was a favorite of Jim’s; he was absolutely able to get his seafood craving met when we visited this local establishment in Pensacola. We originally went to the sister restaurant next door, The Fish House, but we could get seated quicker at Atlas. We were told the food was mostly the same. 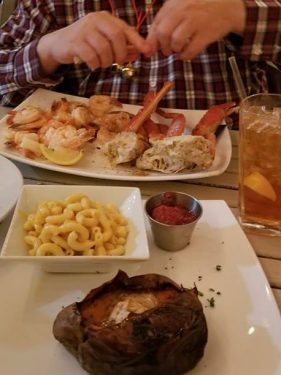 Jim loved it and would go again (remember, I’m not a seafood person, but my hubby is). 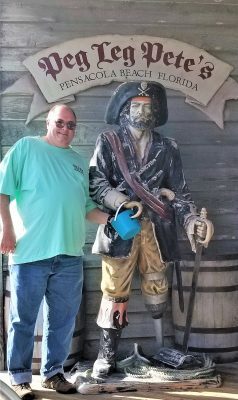 Finally, we take you to Pensacola Beach to Peg Leg Pete’s. Jim and I both liked this restaurant so much that we took friends there to eat with us when they dropped by to visit. It is a great place for seafood lovers, and those who don’t love seafood so much, to eat. Don’t forget the Key Lime pie for dessert! 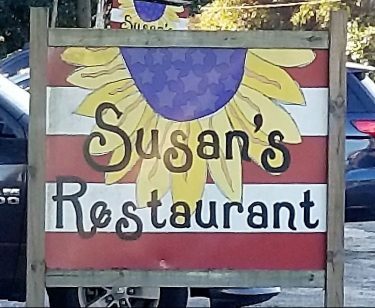 Moving east across Northern Florida, Jim and I are big fans of Susan’s Restaurant in the very, very small town of Holt, Florida. This is where you want to go for your meat and three, or as it is called there, the Blue Plate Special. Susan’s also provides some dreamy ice cream choices, too. It’s only a mile or so off of I-10, you if in the area, you have no excuse not to stop and try it out. In Live Oak, Florida, Downtown Cafe is our pick this time around. Literally, located downtown, you must get in early as the restaurant closes at 2:30 p.m. Jim had the French Dip, and I had the Chicken Cordon Bleu Wrap. All I can say is YUM! They have baked goods, too, so Jim had to pick up a couple of Oatmeal Raisin cookies to go for dessert. 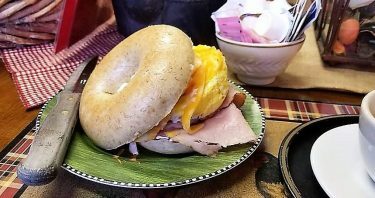 Finally, if you find yourself in or near Madison, Florida, between September and May, you need to find Sunshine Coffee Shop. I was totally unprepared for the visual stimulation this coffee shop has to offer. It is a feast for all of your senses. Per their website, “Pete, former Army special forces, and Moruna, an international fashion model” who was born in Trinidad, chose the small town of Madison and opened the shop in 2015. You need to read their story on the web site. When I visited, I hit a lull and was able to chat a bit with Moruna, who has a gift of food preparation as well as decoration. Check the hours as they do vary. The servings are large; I had to take part of my breakfast sandwich home for later. You won’t regret the stop. With regard to service kudos, I have two to share. First, I give a shout out to Graffiti Pizza in downtown Pensacola. After an afternoon of attempting to finish our Puzzling Adventure in Pensacola, we popped into the outside bar for some liquid reference refreshment (non-alcoholic). These service we received was friendly and very accommodating. While their pizza looked and smelled amazing, we could not eat after walking around so much. Had Jim and I had time for another run to downtown Pensacola for a meal, I know we would have gone back to this restaurant. Finally, my last recommendation for service has absolutely nothing to do with food. I have to give a big thank to the Cantonment, Florida, Post Office. We’ve been to dozens and dozens of Post Offices around the country over the years, and I’ve never had the kind of helpful service I received during my visit to this post office. The service was timely, but most importantly, helpful. The person who helped me made a couple of suggestions than took about 30 seconds to implement and saved me several dollars. For that kind of service, I must give kudos. Let us know of places you can recommend for food or service. Maybe we’ll have an opportunity to visit those places sometime. You’ve certainly made your way through the small towns! We love that. 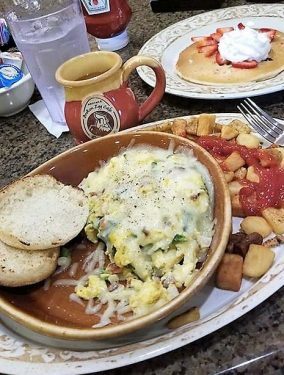 If you ever find yourself looking for another mom and pop style restaurant, stop in and see us for breakfast or lunch. Crawfordville, Fl would be our closest location to Pensacola. Okie dokie, I’ll try to remember that. Thank you!